I’m not a neat person. Seriously, you should see my bathroom vanity – it’s a sea of abandoned beauty products, brushes, and blotting tissues that I’ve hurriedly cast aside. In general, I’m way too busy to fiddle with putting things away when I’m done – much to my husband’s chagrin. But for what I lack in general tidiness, I more than make up for in organizational skills. My clothes closet is impeccably organized at all times. My entire room could look like it’s been through a tornado, but my closet is the calm eye within the storm. Why do I pay so much attention to the state of my closet? Because I’m perpetually short on time and I want to make the most of every piece I own. How often have you bought something, worn it a couple of times, and stuck it in your closet, only to forget about it? It never happens with me – I rotate my outfits like some do their food storage. Who knows, you might be able to shop your own closet when you realize what you actually have on hand. It’s worth an afternoon of organizing if it means you can save a bit of cash by not shopping for a frock or a pair of shoes you actually don’t need. I have two ways of organizing pants. First, casual jeans, skinnies, colored denim, and corduroys are all folded and placed into cubbies. I like to do this because they’re front and center where I can easily access them. I also like that I can clearly see the wash color when choosing my jeans in the morning. When it comes to getting the right look with denim, wash is everything. My dress and work pants are hung using the clip hangers you can score for free from clothing stores – just ask to keep the hangers when you buy new pants. That way, I’m not scrambling for an iron when I’m late for a work meeting. Dresses are a breeze to slip on during time-crunched mornings. That’s why I keep them near the front of the closet for easy access. I find that cotton and jersey dresses are less likely to get wrinkled, so my long maxi dresses and skirts are folded over the bottom run of a hanger. This doubles my closet space and allows me to see more stuff. I recommend organizing tops by sleeve length. I dress for the weather, so it speeds up my time in the morning to know exactly where I can find all of my jackets or tank tops. It also helps me to create new outfits. I can grab a tank from one side of the closet, and a boyfriend cardigan from the other side, creating an instant outfit. Casual t-shirts are folded into a dresser, but all tops that are work-appropriate are hung to prevent the need to iron. Shoes are best organized when you can see both the front and the back of each pair. That way, you can grab the right pair with the right heel height, which is very important if you’re going to be wearing a pair of shoes all day long. I also organize shoes by color so when I’m looking for the right pair, I know exactly where they can be found. When I was a teenager, my first job ever was as a stock girl at a grocery store. One of the first things I learned there was to rotate the food so that the older cans were up front and more likely to be purchased before the new stuff in the back. I’ve suppressed the memories of getting yelled at by the produce manager, but I’ve retained the idea that you need to rotate your closet like you would canned food. 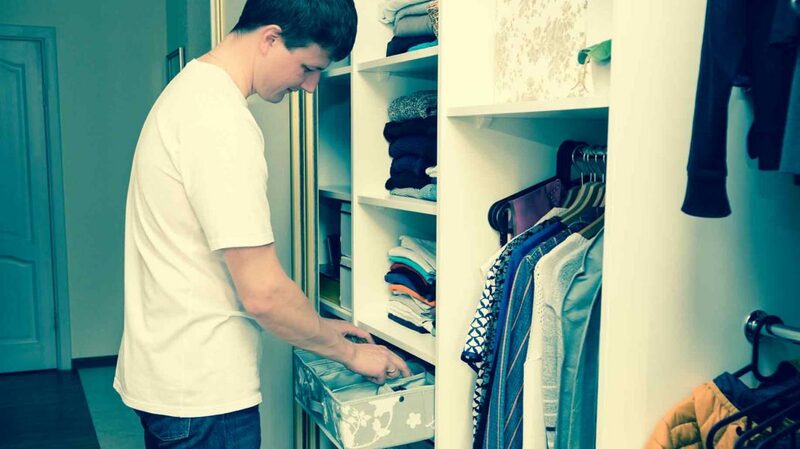 Items stashed in the back of the closet will remain in the back of the closet, completely forgotten. When I do my laundry, I always make a space at the back of the closet to hang up washed clothes. That pushes the older stuff to the front, where I’m more likely to see it, grab it, and figure out new outfits. I might be a little obsessive when it comes to closet organization, but it makes a major difference in the time I spend in front of my clothes, wondering what to wear. When I’m short on time and feeling uncreative, my closet pushes me to try something new on the fly. If only my makeup bag could be so inspirational. Do you keep your closet organized? What are your best tips?